And you thought, other than the presence of Al Gore and promotion of “Babel,” this year’s Academy Awards ceremony–this Sunday–was politics-free, for once. Unfortunately, a silly spoof of “West Side Story,” made by far-left Jews has been nominated for Best Live Action Short Film, equating innocent Jewish victims of terrorism to their Palestinian Muslim terrorist murderers and reducing the loss of their lives and limbs to a friendly falafel competition. While Jews (and others) have been blown to bits at falafel shops (and pizza places and bars and cafes, etc., etc., etc. ad nauseam) by Palestinian terrorists, “West Bank Story,” makes light of the attacks by Islamic terrorists against Jews in Israel by boiling it down to a Jets vs. Sharks ethnic fight where both sides are equal and they all make piece over music, dancing, and falafel. Sorry, but the Italians and Puerto Ricans never blew up themselves and innocent people in a Pizza shop or bus station. Only the Palestinians did that, with the full support of their people. 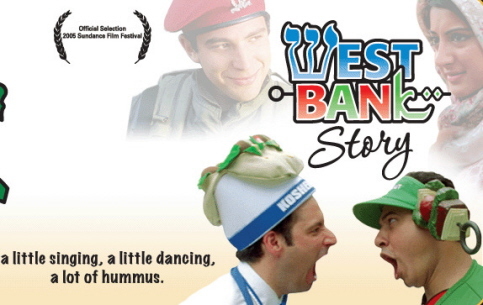 That this 20-minute movie boils it down to both sides fighting for control of the falafel industry is not just silly, callous, and obtuse, it’s worse–a desecration of the many living and dead who were maimed, many fatally, by the actions of these joyous people shown dancing over falafel. This isn’t over ground chick-peas fried into balls. It’s over the right of the Jewish people to live in peace and freedom versus the avowed Islamic goal of annihilating them from the planet. Take Daniel Wultz, a handsome American teenager and Miami Heat fan who dreamt of becoming a rabbi. He was blown up while eating at Mayor’s Falafel during Passover, last year. 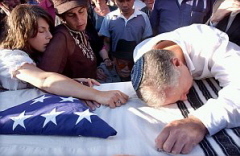 Ditto for Lior Anidzar–a working-class auto mechanic, whose family emigrated from Arab Muslim lands to escape the deadly anti-Semitism. 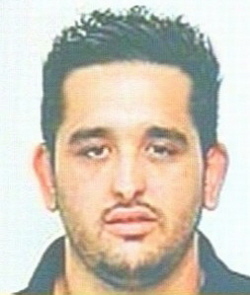 Both are dead, murdered by homicide bomber, Sami Salim Ahmed–not a dancing falafel maker, but a cold-blooded killer. And now, both Wultz’s and Anidzar’s lives are parodied in this silly Oscar-nominated trash. Their lives are now, “a little singing, a little dancing, a lot of hummus.” But when they were at the real-life falafel joint, all that anyone heard was an explosion and lots of shrieking. Since the “film” was made and released in 2005, it shouldn’t even be eligible for this weekend’s Oscars. But in Hollywood, where there’s a will to promote left-wing propaganda, there’s always a way. Watch for this absurd perversion to win the Oscar. It’s got all the makings for getting one of those lackluster golden statuettes. I’d like to thank the Academy . . . for nothing. What’s next–“World Trade Center Story”? Although They Were Murdered Behind Israel’s Green Line, Here’s the Real “West Bank Story” . . .
“1. To be eligible for award consideration for the 2006 awards year, a short film must fulfill (within two years of the film’s completion date) one of the following criteria between October 1, 2005 and September 30, 2006…”. Of course, I haven’t seen the film yet but I totally understand why people are offended by a comedy that treats a very serious situation in a flippant manner. If this movie does win an Oscar, maybe the Jewish makers will explain their intentions if they haven’t done so already. Al Sharpton’s fueled pogrom in Crown Heights,Brooklyn several years ago,I figured I had more in common with people from totally non-Jewish backgrounds-as I’m not a contemporary liberal or a Democrat. When I was growing up several Nazi death camp survivors in the neighborhood had the same objection about Hogan’s Heroes. Time has shown that show, and Bob Crane, weren’t worthy of the attention. I only wish this kind of thinking was relegated to far left Jews. Unfortunately, this disease of moral equivalence and the trivializing of muslim terrorism has infected liberal Christians as well. This reminds me of an interview I saw on EWTN the other day where the Catholic interviewer was talking to a “moderate” muslim. In response to a question, the muslim commented that the palestinians and Israelis were acting like children. The Catholic interviewer just nodded dumbly like the dhimmi he is. From what it looks like, it’s not all that comparable to Hogan’s Heroes. If they went and made a comedy about a bungling suicide bomber who fails and ultimately ends up killing only himself, I’d be all in favor of that. It’s fitting that an idiotic look at these issues is framed within the idiotic American musical “West Side Story”. Such lack of imagination and originality. Why don’t they stage a version of Romeo and Juliet while they’re at it … (“Rami and Janet”?)? Humor has a place in every issue, but not any kind of humor and not in any kind of place. I was just wondering if anyone here has lived in Israel or the Occupied territories? Do you really know whats going on? There are always two sides to the story, but I am not saying either is right. Yes, it is wrong to blow yourself up and kill innocent people at a market, and it also wrong when searching for the persons house that did it to destroy a whole neighborhood of homes and leave multiple families homeless. It is also wrong when searching for the perpetrators family to walk into peoples homes with out warning and just shoot and kill everyone in the home. I only know this because I once had a client who just came from the middle east and just buried pretty much his whole family including grandparents that were well into their 90’s(what harm do these people cause) and to top it all off his family had nothing to do with any suicide bombers. Why dont we hear about these things on your site Debbie. Yes wrongs are happening but its not one side who is wrong it would have to be both. We will never get further if we keep this biased attitude toward muslims, arabs and everyone else who does not think that the Isralie Govenment should not exist. I for one think that this government should’ve been unified from the first day. I do not think that we would be having these problem if it were unified. Isn’t odd that we fight others because they want an islamic but we turn our heads when there is a Jewish state. They wish for the destruction of Palestianians and pretty every other arab country in the middle east. They were Anti Iraqi-Anti Iranian- Anti Lebanon and anti arab in general. Its funny that we cant see that. I was born and raised as an american and i have the common knowledge that if everone says the same thing about one thing everyone must be right not the one thing. Last time I checked, there were more than a dozen Muslim countries. So let’s turn the question around – why are Muslim countries allowed to get away with the worst human rights abuses anywhere in the world, but Israel is expected to defend itself with its hands tied behind its back? If there were Mexicans digging tunnels under the border and blowing themselves up in public areas with the implicit (and often explicit) support of the Mexican government, I guarantee you Americans would not tolerate the level of restraint that Israel shows. From the beginning, the arab countries have tried to destroy Israel. The arabs are always the aggressors. Even after arafat was handed control of the West Bank and Gaza by Israel, the arabs sought to destroy Israel. Even after the Gaza pullout, they still refuse to renounce their goal of destroying Israel. The palestinians bring down violence on their own heads by harboring the terrorists. As to your absurd claim that both sides are “wrong”, the aggressors (the arabs) have no right to whine and complain about responses to arab violence. I suppose you think the US was wrong to attack Japan after Pearl Harbor, or wrong to attack Nazi Germany after they declared war on the US. Well, arabman-the question could be answered in a number of ways. One way is to ask you how you can justify multigenerational psychopathic killers aka the palestinian people. They either kill or approve of killers and elected a government full of killers(hamas). I am not a liberal multiculturalist, and I am not afraid to tell you that your post is bullsh**. You may be able to have an audience on KOS or CNN, but I don’t buy one bit of your “victim act”. You will get no sympathy from me whether or not I have lived in Israel, which is irrelevant. YOUR people were offered multiple opportunities to make peace. Arafat played everyone and turned all opportunities down. And what of Jordan and all the other arab countries who allow generations of palestinians to live as they do, without offering them anything. “It’s all Israel’s fault”….bla,bla. Israel is not anti-arab, arabs living in Israel have the best quality of life in the Middle East. From where I stand, you are weak cowards who do nothing but externalize blame. Those 90 year olds were lucky to live that long, as YOUR murderous muslim brotherhood has blown innocent Jews to bits and laughed about it. If you were really born and raised in America, the only thing you have learned is how to be a muslim victim. Hi Debbie – I just want to know: Did you see this movie? BTW – I agree with a couple of statements I have read on this site. Freedomland was a terrible movie. And if you were president, you would indeed be Babe-raham Lincoln. YES, I DID, AND AFTER SEEING IT, IT WAS EVEN WORSE THAN I ORIGINALLY DIAGNOSED.